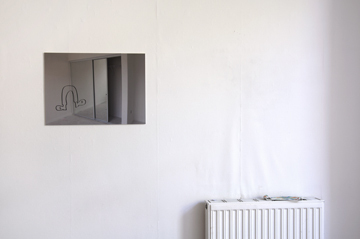 Approximations (Diagrams to not here) translates the spaces that house the body after life. This transposition of measurement is a commemoration to the ways in which loss and the unknown are materialized through from and ritual. The “average” North American burial plot dimension, urn volume, weight of ash remains, and fireplace mantle surface area are distilled into floor-based objects, functioning as referents or stand-ins for future events. These works aim to highlight the lack of subjectivity produced through the use of catch-all standards surrounding expected behaviours and customs. Approximations (Diagrams to not here) mirrors the dynamics of the individual within institutional space, where things can fail, hit boundaries, or become lost in translation. Sheena Hoszko, born 1982 in Quebec, lives and works in Montreal. Hoszko pursued undergraduate studies at Emily Carr University of Art + Design and is currently completing an MFA at Concordia University. Selected exhibitions include Your Name in Lights, The Helen Pitt Gallery, 2004; Mimic, La Centrale Galerie Powerhouse, 2006; The Only Way Out is In, The Leonard & Bina Ellen Art Gallery, 2006; Stolen.Bike.Mtl, articule, 2008; Café Cleopatra, DARE-DARE, 2012 (upcoming); and Hoszko will be in residence at Villa Magdalena K in Hamburg, Germany during the summer of 2012. 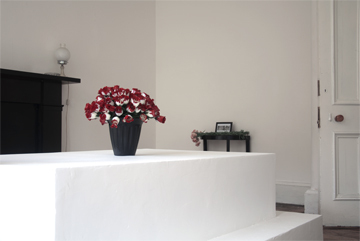 At the end of each day is an installation project about the anticipation of forthcoming loss. Composed of a site-specific text piece and a poster multiple, the work uses two paralleled time-based disappearances to suggest a link between the lover’s body and landscape. Since her graduation from Concordia University in 2006, Michelle Lacombe (Montreal, QC) has developed a practice that is located somewhere between the concerns of performance and the visual arts. Her work has been show in Canada, the USA and Germany in the context of performance events, exhibitions and colloquiums. * For this event, RDC will temporarily occupy STUDIO 41, located at 41 West Graham Street, Glasgow G4 9LJ (located just along from Glasgow School of Art’s Barnes Building). Using tribal iconography, pop-culture and primitive expression as a stimulus for irreverently assembled totemic plaster and painted forms, Michael White explores a hierarchy of objecthood divulging the redundancy of the Monument. White juxtaposes tribal custom with contemporary culture, expanding and mutating the idea of a meaningful object into a self-conscious and exposed sculptural offering. The formed grotesquerie displays an extensive enquiry and understanding of the lineage of traditional sculpture, applauding its heroes and questioning their authority. Michael White graduated from Glasgow School of Art in 2009. Previous shows include: New Work Scotland, Collective Gallery, Edinburgh, 2009; Bad Igloo Lust, The Royal Standard, Liverpool, 2010; ‘So Miami!! 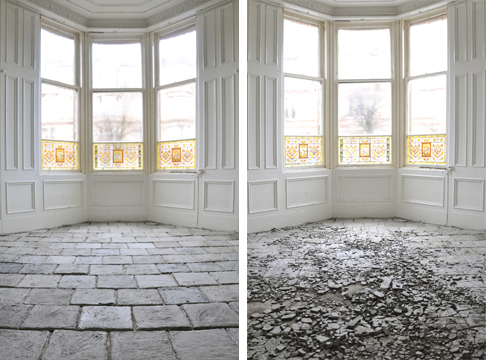 !’, The Duchy Gallery, Glasgow, 2010; and Insert Tiara at SWG3, Glasgow, 2010. 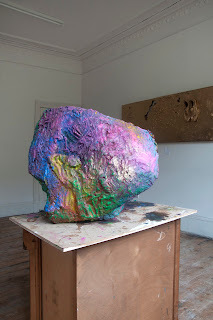 His forthcoming solo exhibition is at Hannah Barry Gallery, London, 2012. * This will be the last RDC exhibition at the 11 Woodlands Drive location. We will keep you posted on our future exhibition space. Mathieu Latulippe lives and works in Montreal. Whether they are objects, installations, models, photographs, gestures or video, we can say that all his projects find their unity in the fact that they are always an exploration about different physical, social or cultural perceptions which determine or influence how we see and feel objects, space and people around us. He has had exhibitions and events in Canada and internationally including The International Festival of Films on Art (Montreal, 2005 to 2008), the Quebec International Art Manifestation (2008), Clark Gallery (Montreal, 2009), Uqam Gallery (Montreal, 2010), Netwerk, L'Établissement d'en face (Belgium, 2010), and at the Darling Foundry (Montreal, 2010). He was artist in residency at Le Lobe (Chicoutimi, 2006), at Daïmon (Gatineau, 2008), and recently at Among other things in Turkey (Bolu, Istanbul, 2010). He has forthcoming solo exhibitions at L'Imagier (Gatineau) and at the Rez-de-Chaussée Gallery (Glasgow, Scotland). 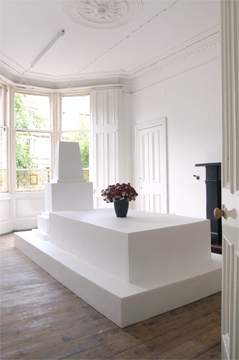 A publication written by Sarah Godfrey will accompany the exhibition. For his solo exhibition at Rez-de-Chaussée Lawrence Leaman presents new works in clay, chalk pastel, watercolour and digital print. Within the Victorian decor of the exhibition space a partition wall has been installed. The wall is cladded in plaster board, unpainted and light grey in colour. 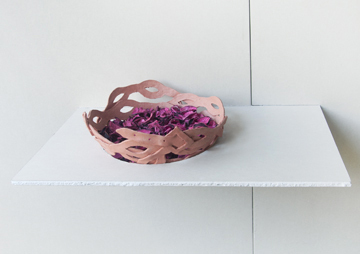 A shelf holds a faux-terracotta clay bowl. On the opposing original wall two digital prints are tacked over the wall paper. Each print displays an internet sourced image with an added line drawing made in Adobe Illustrator. Between the walls stands a table frame with wire mesh stretched across its top: modelled Kerimistone leaf forms lie across the mesh. The exhibition title Agar Suite names the Rez-de-Chaussée gallery space in the tradition of hotel rooms and reception areas. ‘Agar’ is a jelly substance used in the biological sciences as a growth medium for cultivating micro-organisms. 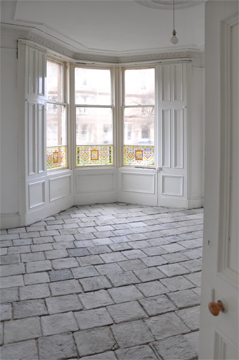 The front room of a Victorian terraced house can be the setting for a G.P. or dentist’s clinic. There, decoration ceases to connote safety - the domestic home environment, as clinical function encroaches on original features. Aesthetic concerns are replaced by an understanding of use, although here - in Agar Suite - use is always speculative. Lawrence Leaman lives and works in London. He studied BA in Philosophy at University of Warwick 2003-06 and MA in Contemporary Art Theory at Goldsmiths College 2008-09. 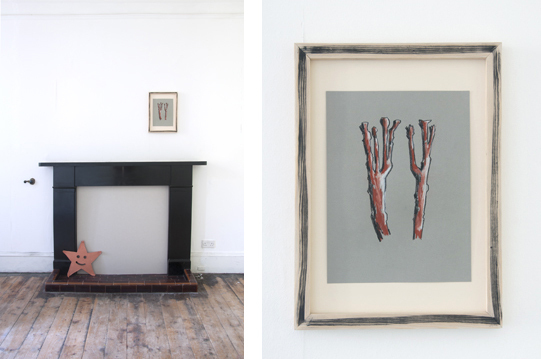 His previous solo exhibition was Floreat Salopia at Outpost Gallery, Norwich 2010. Forthcoming group exhibitions include Suppono Subpono with David Osbaldeston and Joe Devlin at E:vent Gallery London, 2011. Kate V Robertson is based in Glasgow, Scotland, and completed her Masters of Fine Art at Glasgow School of Art in 2009. 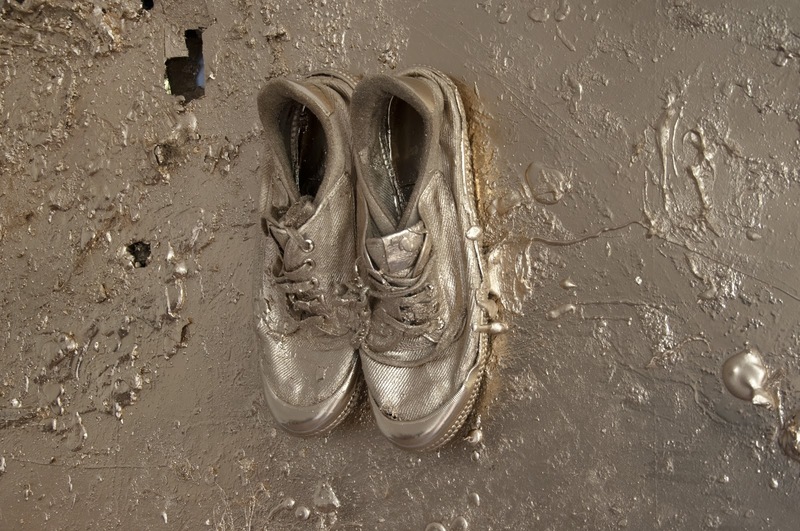 Recent solo exhibitions include 'To Be Continued...' at Edinburgh Sculpture Workshop, 'Pieces', at Galerie Feinkost, Berlin and 'Tomorrows Another Day' at Market Gallery, Glasgow. Group exhibitions include Running Time in the Scottish National Gallery of Modern Art, Rubble Stir at The Glue Factory, Glasgow, All Insignificant Things Must Disappear at Trinity Church, New York City, and Breaking Windows, Feinkost, Berlin. Working across mediums, Kate also installs work in public places - recent offsite projects include Notices, featured in last year’s Edinburgh Art Festival, and a temporary outdoor sculpture outside the BBC, for Glasgow International. 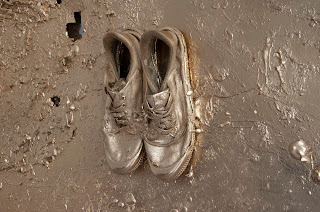 In 2009 Kate was shortlisted for the Artists Taking the Lead London 2012 Cultural Olympiad Commission, and has just completed a Creative Lab residency at the CCA, Glasgow. Rez-de-Chaussée is an artist-run initiative that exhibits local and international artists. 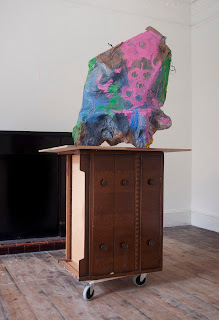 It is operated by Suzanne Déry, Marie-Mich​elle Deschamps, Geneva Sills, Justin Stephens, and Zoe Williams, all current MFA students at the Glasgow School of Art.